What is art? It’s a question as old as the practice itself, and one to which the answer was often found in print either in textbooks, artistic journals or solitary columns in the pages of newspapers. For those who live outside of art academia, art criticism and news articles in traditional news media about upcoming shows were once a valuable way to introduce art to audiences of all backgrounds. Today, we must ask if those days are truly behind us. 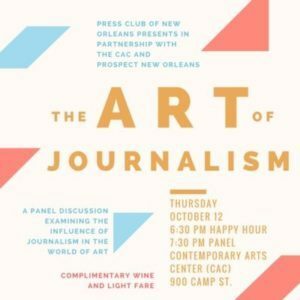 The Art of Journalism, a 1.5-hour panel discussion hosted in partnership with the Press Club of New Orleans (PCNO), Prospect New Orleans and the Contemporary Arts Center (CAC), will focus on the role of journalism within the realm of art. Artists, journalists and art critics will explore how art events and exhibitions are reported, the role of media in examining the works of artists – local, national and international – and how that coverage has affected the style, focus and careers of working artists as well as how arts institutions and purveyors of art have responded to the abundance and consistency, or lack thereof, of the media’s coverage of art. Founded in 1957, the Press Club of New Orleans is a 501(c)(3) organization dedicated to promoting and progressing the fields of journalism and communications through professional development. For more information, visit www.pressclubneworleans.com. Led by Artistic Director Trevor Schoonmaker, Chief Curator of the Nasher Museum of Art at Duke University, Prospect.4: The Lotus in Spite of the Swamp brings together 73 artists from North America, Latin America, the Caribbean, Africa, Asia and the European powers that colonized New Orleans. Taking place within the context of the celebration of the city’s Tricentennial, it pays particular attention to issues of identity, displacement and cultural hybridity. More than 30 artists are creating work specifically for the exhibition, and approximately 10% of the selected artists hail from the New Orleans area. To enact this ambitious vision, Schoonmaker was aided by an Artistic Director’s Council of seven international artists and curators who will participate in public programming surrounding the exhibition and contribute to the fully illustrated catalogue, published by DelMonico Prestel books and Prospect New Orleans. Prospect.4: The Lotus in Spite of the Swamp, will open to the public on Saturday, November 18, 2017 and run through February 25, 2018. The Contemporary Arts Center (CAC) is a multidisciplinary arts center dedicated to the presentation, production, and promotion of the art of our time. Formed in 1976 by a passionate group of visual and performing artists when the movement to tear down the walls between visual and performing arts was active nationwide, the CAC expresses its mission by organizing world class curated exhibitions, performances, and public programs that educate and enlarge audiences for the arts while encouraging collaboration among diverse stakeholders composed of artists, institutions, communities, and supporters throughout the world. For more information visit www.cacno.org.